I mentioned in my first pasta post that I would soon include a simple and delicious pasta sauce that I cook on a regular basis. Well here it is. This is a much simpler recipe than most of the Bolognese recipes out there, so it makes it ideal as a mid week meal. It's also a great one to freeze. 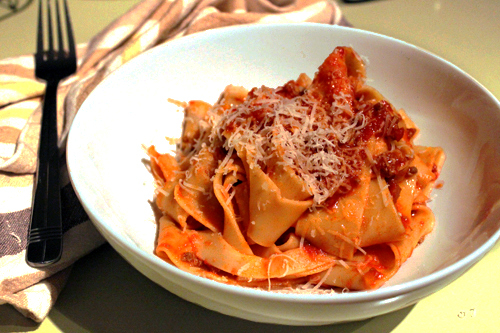 I have a more complex Bolognese recipe on file which I am eager to cook soon too. This recipe comes from my mum, and something that I remember learning at a young age. Most of the time when I cook this recipe I don’t use the carrot and celery, purely because I can’t be bothered. But in this instance I thought I would go back to how it should be made. You can use any pasta with this as well. My brother’s favourite is penne, my mum and dad's is spaghetti or fettuccini, and mine is linguine. For this meal, I decided to go with pappardelle. In a large pot, cook the garlic, onion, carrot and celery in the oil until they become slightly translucent. Add the bay leaves and mince. Using a wooden spoon, break up the mince until there are no big chunks and it becomes completely mixed with the vegetables. When the meat is no longer pink, add the tin tomatoes and the passata. Fill the tin half way with water, making sure you get all the tomato off the tin, and pour into the pot. Give the sauce a good stir and add in salt and pepper to season. Bring the sauce to the boil, then reduce to a simmer and place the lid on. The sauce will take around 1 - 1 ½ hours to cook. Time may vary depending on the size of the pot. Give it a stir every now and then and taste for seasoning. It will be ready when it becomes a nice thick consistency and the acidity of the tomatos is gone. Bring a pot of water to boil, add salt, and then add the pasta (usually 100g per person). Cook the pasta as per the instructions on the packet. When al dente, drain the pasta and return to the pot. Add the sauce and combine well. Serve with parmesan. I know, it hurts me you say such words... :) do you still have the bottle of sauce I gave you? This is a good recipe to use!